I have not talked to Dan Johnson about his speech, but I do know that he works very hard to support our community and our kids. He runs a large, successful, self made business that donates tens of thousands of dollars every year to philanthropic causes. He has done and continues to do many good works. People make mistakes. Successful people who are public figures and make mistakes often get hammered in the public eye. I don’t understand why Dan gave this speech without reference, but I still appreciate his huge commitment and contribution to our community. As a former editor-in-chief of the Arcata High School Pepperbox, I once considered it my job to reflect the voice of the student body. In the recent news coverage of the Dan Johnson plagiarism controversy, there has been an apparent lack of the student perspective. Therefore, I would like to offer a view from the students’ eyes. Most graduates agree that what Dan Johnson did was wrong, although it is difficult to go on record saying so because many of us have some tie to the family (friend, teammate, classmate) or have enjoyed the generosity of the Johnsons at some point in our four years of high school. I believe that is why we have been content with having our parents duke it out in the Facebook comments – they are saying everything we could say ourselves about why plagiarism is unprofessional and insulting. As such, I don’t feel the need to denounce what Mr. Johnson did any further, as others have taken care of that for me. I recognized the speech right away, sitting in the front row at my graduation, and yes, I was very angry. Three weeks later, I am still upset, but no longer because of what Mr. Johnson did. I am more disappointed in my principal and superintendent, who it appears are more afraid of insulting a school board member and a wealthy benefactor than standing up for the educational integrity of the district. In the July 3 Arcata Eye article, neither one truly addressed the issue or even hinted that Mr. Johnson should apologize. Which begs the question: Are they going to let him get away with it? Some argue that plagiarizing a speech at a high school graduation teaches students that plagiarism is acceptable. In reality, every AHS graduate knows without a doubt that plagiarizing is a serious crime in the academic community – even Mr. Johnson’s actions can’t erase four years of adhering to scholastic probity. Rather, if Mr. Johnson refuses to apologize or even acknowledge his error, it teaches us graduates that power and money lets you get by with a different set of rules. During my senior year basketball season, Mr. Johnson, as an assistant coach, gave the team several motivational speeches that were very effective and helped us complete a successful season. He is certainly a gifted orator – that is, if those words were in fact his own. If they were, perhaps he could use his own skill to write a public apology. One of the lessons so deeply drilled into us as students is “do your own work.” For this reason I was surprised and embarrassed by Dan Johnson’s apparent lack of regard for the educational ethics he claims to encourage and uphold by his position on the school board. I can only imagine how his daughter felt as he flaunted her about on the stage, subjecting the audience to anecdotes about her childhood and reading to her what should have been a private letter – a letter that should have been co-signed by Mr. David McCullough, Jr. While I and many of my peers were insulted by his stolen words – the AP English class in particular was very familiar with the speech, having had it assigned to read the past year – I feel more let down by the school board and the administration of Arcata High School. While Mr. Johnson faces much censure for his actions, as well he should, the administration talks about how the rest of the ceremony was a success, and the school board seemingly turns a blind eye. Their reasoning seems to be that if they ask for his resignation, he will withdraw all assistance to the district. If this is the case, it means the school board is sitting idle out of fear. On top of condoning plagiarism, they are showing students and parents that it is all right to sit by while people whose wallets are a bit more padded flout the rules which the rest of society is expected to follow. This incident is an unsightly blemish on the face of the district and everything they claim to uphold. It would be foolish to expect an apology from Mr. Johnson, as he clearly thinks himself above such an act of contrition. However, I heartily believe that in order for the school board to save what little face they have left and show that they will practice what they preach, they would be wise to clamor for his immediate resignation. In school, students are taught that cheating and plagiarism is not OK, and if we do that, we get in trouble for it; we don’t get credit for that assignment and maybe even a detention. 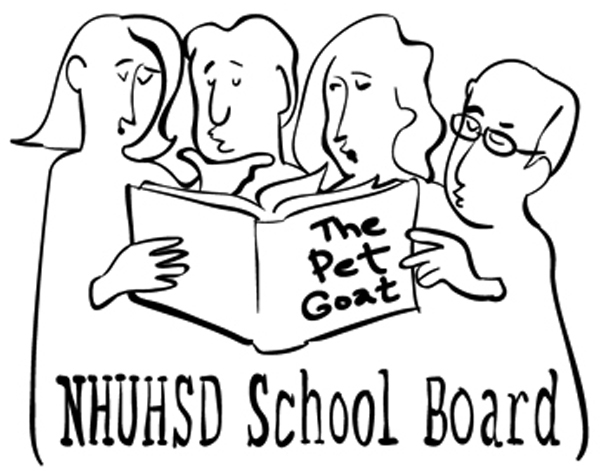 Members of the school board are supposed to be setting an example for us, and if they cheat or plagiarize, they are teaching us that grown-ups or people with power are exempt from the rules that the rest of us must follow. And that’s not OK. It seems to me that if Dan Johnson is allowed to get away with plagiarizing his speech, that teachers at Arcata High can no longer reprimand students for plagiarizing, either. Mr. Johnson isn’t any more special than we are, is he? Regarding Mr. Dan Johnson’s plagiarized speech at Arcata High’s 2013 graduation. For over ten years, I taught the technical communications class to HSU engineering students. Over that time, I observed that more and more students are already aware of plagiarism and stealing of intellectual property before starting my class. Kudos to teachers who are preparing our children for these fast-evolving and ever-changing times! However, I believe there is a half-generation of folks who really don’t understand that stealing intellectual property is wrong, because cut and paste copying is so easy via the internet. Those of us of a certain age (say, Mr. Johnson’s age), could be very much in the dark. “I am very sorry that I plagiarized the speech that I gave at the Arcata High School 2013 graduation ceremony. I am not just sorry that I got caught; I am truly sorry to have acted in a way that has embarrassed our school board, our high school district, and our community. Especially, to students and young people, please accept my apology. “I truly did not know that intellectual property can be stolen, exactly like how a car or money or a famous painting can be stolen. I’m a real estate developer, and I deal with things that are, literally and figuratively, concrete and therefore difficult to steal. My working world is based on houses, business structures, and apartments. I do not work much in the “new economy” based on services, design, ideas and concepts, and patents. I did not recognize that such invisible things like words or ideas are actually created and can be owned by someone. Further, I did not stop to think that a writer or creator may feel angry or taken advantage of, when someone like me takes credit for his ideas and words. “Believe me when I say I know it now! And again, to all in our community, please accept my sincere apologies. To Mr. Johnson or any who wish to use all or portions of this letter, please do—but with proper attribution please! This entry was posted on Wednesday, July 17th, 2013 at 11:45 am	and is filed under Opinion, Community, Business. You can follow any responses to this entry through the RSS 2.0 feed.